First things first » Blog Archive » Sew what have I been up to? Sew what have I been up to? Now that I know how to use my sewing machine, I’m having fun trying different patterns and learning how fabric and thread come together. (Or not–which can prompt the use of some choice words.) 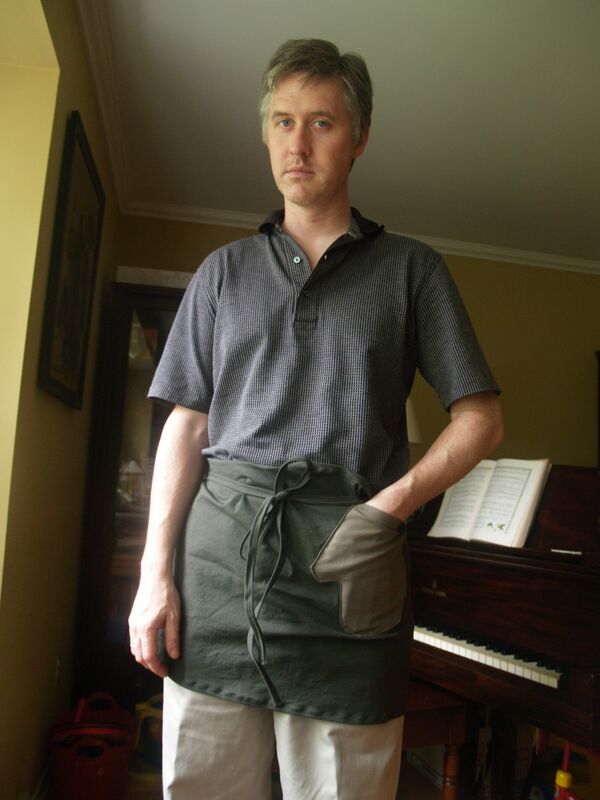 Last month I made this apron (modeled here by Jan) as a birthday gift for my brother. The pattern is from Lotta Jansdotter’s Simple Sewing: Patterns and How-To for 24 Fresh and Easy Projects and he’s the one who gave me that book for my birthday two years ago. Sewing through seven layers of cotton twill (when attaching the ties to the body of the apron) pushed my machine to its limits, and I had some trouble negotiating the thumb curves* when sewing on the hand-shaped pocket (it looks like someone on a bender sewed that part), but overall I think it looks great. One of my birthday gifts this year was Sew What! Skirts: 16 Simple Styles You Can Make with Fabulous Fabrics , and I decided that my first project should be something small. 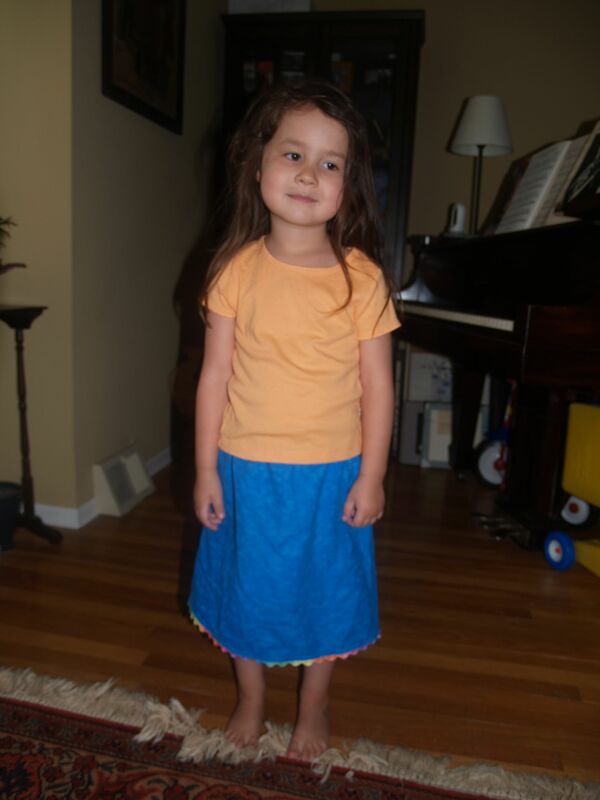 So I made a skirt for Sylvia, using the first “pattern” in the book. It’s for a simple drawstring skirt with an A-line shape, a pocket on the front, and rickrack trim along the bottom. I subbed an elastic waist for the drawstring, ditched the pocket, and kept the rickrack (I found rainbow-colored stuff!) trim. Sylvia loves it! 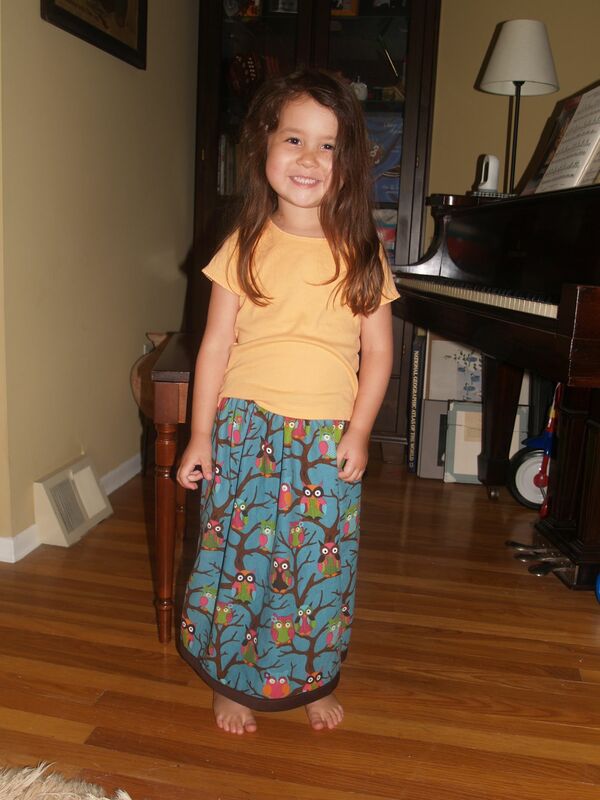 She also likes this skirt, which I made from a funky cotton print she and I found together in the remnant bin at Joann. This time I didn’t follow a pattern or use any measurements. I cut two identical rectangles, sewed together one side, made a casing at the top, strung in elastic (sewing it down at both ends), added bias tape** to the bottom hem, and sewed together the remaining side. I didn’t bother making double-fold seams anywhere, relying instead on pinking shears to control fraying. This was intended to be a quick-and-dirty sew–and it was. And she loves this one, too. I made this final skirt last week, and of all the projects mentioned here it is the only one for which I did not use stuff from the remnant bin. I actually purchased fabric off the bolt for this one. Owls! On corduroy! Seriously–how could I resist buying a yard of this stuff? My plan from the beginning was to make something for Sylvia, but when I got home I was sorely tempted to use it for myself. 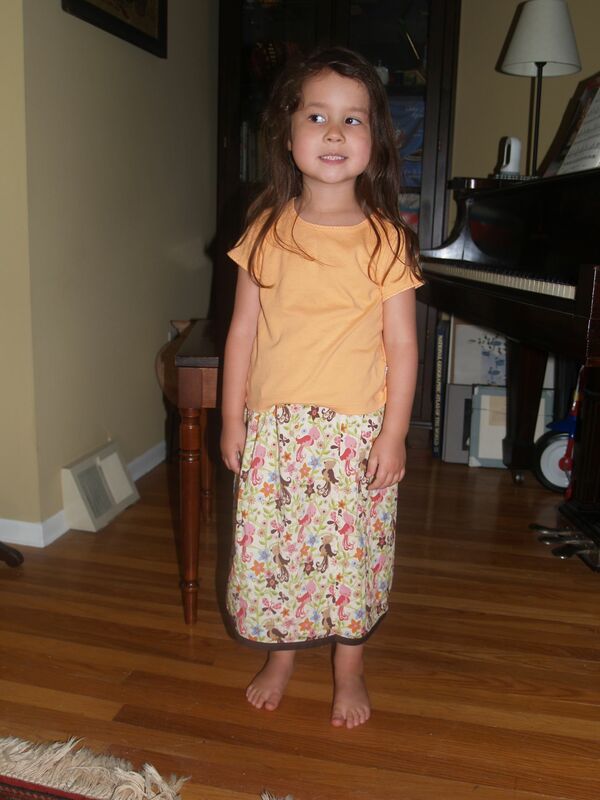 But she really loves it, so another skirt for her was born. I used the same technique as for the previous skirt–easy peasy. **Bias tape is awesome for hem edgings. You get a clean, finished look without investing huge amounts of time and effort. Very fun and funky! Great job! I am so proud of you! Look at what you can do with your sewing machine! That apron is awesome. I love the hand pocket. Sylvia’s skirts are adorable. Kudos to you for making one without any pattern. The owls are super cute – just like Sylvia. Those are all great! I’m so inspired. Great items, great fabrics! Sylvia is growing up so fast! Great job, Marsha. Great skirts. Now when are you going to be making one for yourself? Come on now. You know that’s what you’d be asking me. Are you taking your sewing machine on vacation? @Beth: No, I did not take my sewing machine on vacation (though I did bring my knitting). Don’t worry–I already have plans and fabric for a skirt for myself!